The Data Analytics Bootcamp will prepare students for careers in analytics and business intelligence, including jobs such as data analyst, business analyst, research analyst, and marketing analyst. Students will learn how to apply statistical reasoning through hands-on training in the most widely-used tools, including Excel, Python, SQL, Tableau, and Power BI. Using real data from local companies in a variety of problem domains, such as healthcare, financial services, digital marketing, supply chain, and retail, students will gain practical experience in all stages of the analytics workflow. They will also learn to present their findings via presentations and storytelling, building reports, and creating dashboards. Students will work on individual and group projects to add to their portfolio of work in preparation for their job search. To support a student’s job search, we offer a robust career development program in tandem with our bootcamps to prepare students for job applications, interviews, and offer negotiation. “Our job is not done until our graduates have their first job in tech,” shared Wark. As documented by the Tennessee Higher Education Commission, NSS holds an in-field placement rate of 92% across all their bootcamps for 2017-2018. This program is designed to serve those looking to start in a career in data analytics and those already working in the field but looking to add tools that will make them more effective on the job. No college degree or prior experience is required. For those considering data analytics as a career path, but not quite ready for a bootcamp, our Data Analytics Jumpstart gives you a hands-on introduction to analytics skills and our approach to learning. The first Data Analytics Bootcamp is part-time for six months and starts May 14, 2019. Classes will meet Tuesday and Thursday evenings and Saturdays. Tuition is $7500 and NSS offers a range of payment options, including Nashville Tech Opportunity Tuition, scholarships, and loan options. We also offers flexible payment options for employers looking to invest in upskilling their current employees. 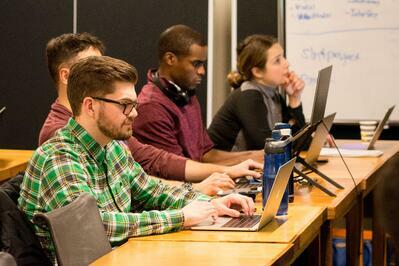 Applications for the first data analytics bootcamp are open. For nearly seven years, we have helped fill the tech skills gap in Nashville by training over 700 web developers and data scientists. As demand for data analytics grows, we are committed to helping fill the talent gap by providing affordable, accelerated, real-world training on the skills needed for data analytics.